My oh my, what on Earth has gotten into Amazon!? Something lit a fire under the nation’s top online retailer because it has been getting its hands on AirPods like a champ for the past two weeks. 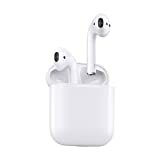 Not only is the Apple MMEF2AM/A AirPods Wireless Bluetooth Headset back in stock right now, but Amazon slashed the price yet again by $14. Grab a pair or two now before they sell out again!